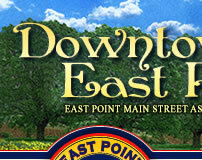 “East Point developed as a City divided east and west by the railroad tracks. As the City grew, getting back and forth across the tracks safely became a challenge, especially, after the widespread ownership of automobiles. With the Central of Georgia’s Industrial Yard, located on the City’s northeast boundary, where the freight trains were assembled – the traffic problem intensified when forming trains extended below the intersection of Cleveland Avenue, block tall crossing for lengthy times, the need for an underground pass was discussed for many years. As early as 1938 plans were formulated by the County funding evaporated before they could be carried out. It was not until the mid 1950s when a traffic study identified the need as critical that the underpass again became a priority item. 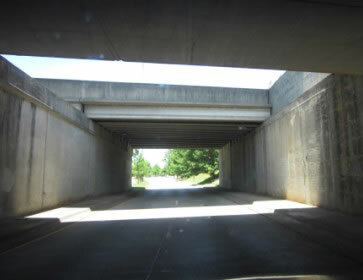 In February 1958, a joint city-county hearing was held to discuss the long-awaited Spring Avenue railroad underpass. 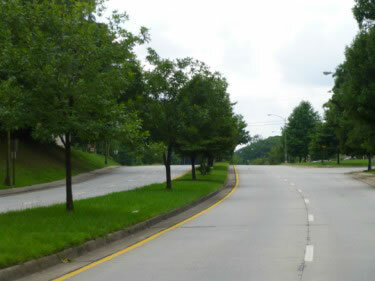 The $1,500,000.00 project was funded through county bonds but carried out by the East Point Public Works Department under the supervision of Wayne Moore. Final approval had to come from the Central of Georgia Railroad which gave sanction only after an agreement that their crews be allowed to construct the bridge portion of the project. Under construction for over two years, the Spring Avenue underpass and extension was not completed and opened until August 1961. The 1.3 mile east-west traffic artery began on Headland Drive at Lumpkin Street and extended under Main Street and the railroad tracks to connect with East Cleveland Avenue. Entrance/Exit ramps were located at Cheney Street and Connally Drive. It was the City’s largest single construction project and, before completion, the cost had almost doubled -- $2,398,545.67! Robert Norman Berry, for whom the street is named, moved to East Point in November 1929, where he became a substitute mail carrier in the East Point Post Office and attended night school at Georgia Tech. Mr. Berry continued with the Post Office and came up through the ranks from letter carrier to clerk. In 1939, he was named Assistant Postmaster and continued in that post until 1952 when he was named acting Postmaster upon the retirement of A. W. Etheridge. With the appointment of Scott Walters, Sr. as Postmaster in 1955, Mr. Berry returned to Assistant Postmaster and served until his death in 1960. A tireless civic worker, Berry had been instrumental in the 1947 re-organization of the East Point Chamber of Commerce, serving as its first Secretary-Manager and then as President. He also served on the Library Board, the Speakers Club, First Baptist Church, the Inter-City Civitan and the Russell High P.T.A. An active and ardent supporter of East Point during the years of incredible growth, Norman Berry’s leadership came to an end on October 14, 1960 when he died of a heart at-tack at age 54. A special Committee of City Council had been appointed to select a name for the underpass connector road then under construction. The Committee recommended the name of Robert Norman Berry and it was unanimously adopted, honoring the memory of a community leader who had, through the years, demonstrated unfailing devotion for his adopted City.